We offer several different customizable reports to meet the needs of your business. This includes the more commonly used Excel and PDF exports. Before we get to reports, below is an example of how you’ll view a time card within our application. You can then export this information several ways by using our reporting options. 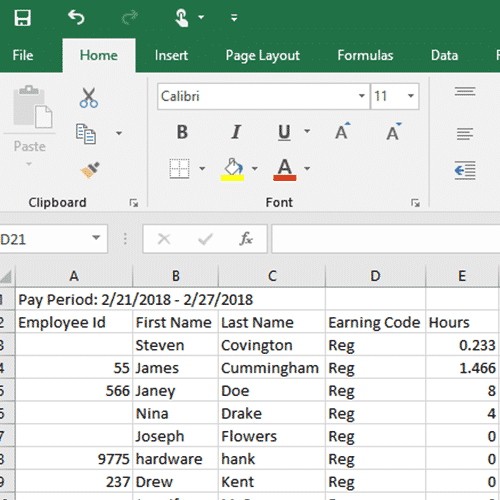 You’ll get a detailed Excel view of your employees, their hours, overtime, locations, and departments. 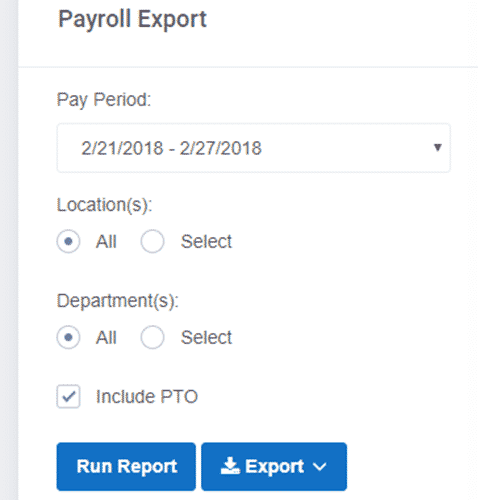 You can select prior pay periods if needed.. If you want a quick report of total hours in a given time (any time) and do not want the in and out activity, this report is for you. You can also export it to PDF or Excel. This report gives you hours by Day, per employee. This report includes PTO. 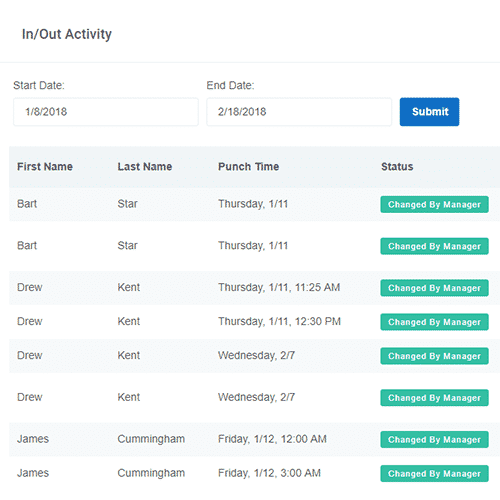 This will show you all the in and out activity for every employee in a set time period. 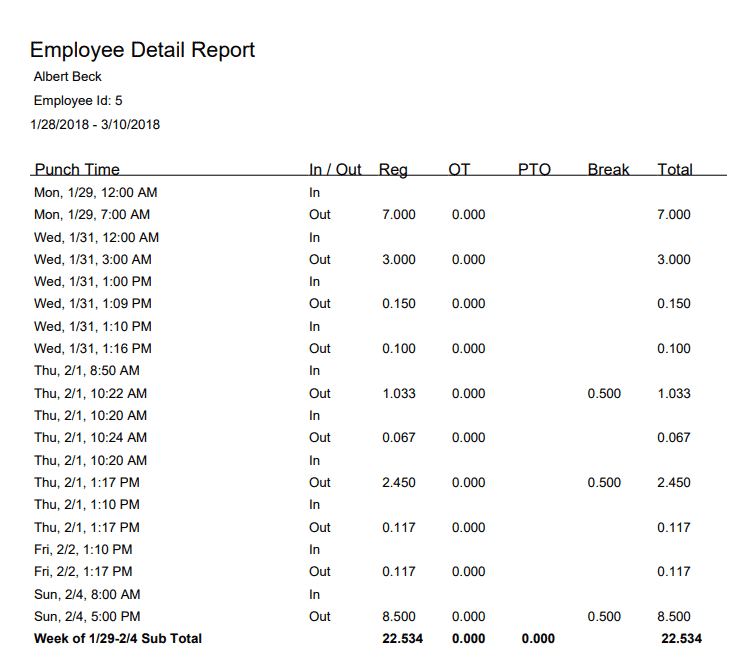 You specify the date range and this report gives you all PTO taken (Sick, Vacation, Personal and Holiday) per employee. 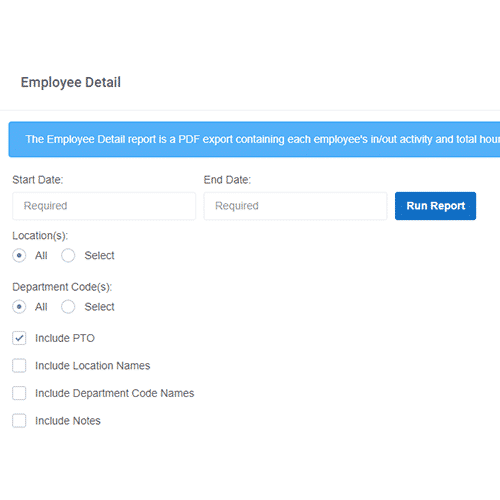 The Employee Detail report is a PDF export containing each employee’s in/out activity and total hours for the date range. This is a great report to print off and give to your employees if they need a detailed summary. We know how important it is to have a robust set of features and functionalities to help you better manage your employees and their time. We pride ourselves on offering many features that are not provided by several other time tracking systems. 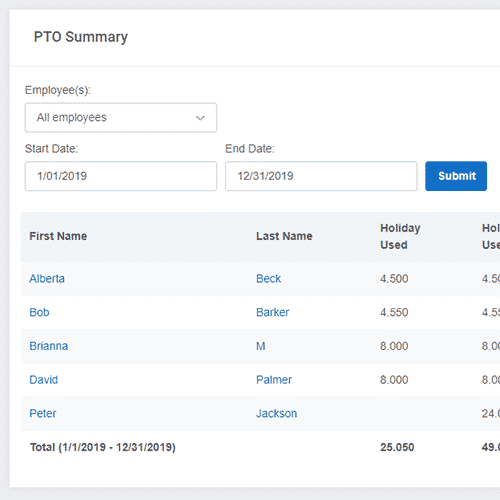 Whether you are looking for simple yet powerful features such as PTO Accruals and Overtime Calculations or more advanced features such as Geofences and QR Codes - we have got you covered! Make sure to check out all of the Other features we offer. Need a way for you and your employees to sign in quickly without hassle? Then our Single Sign On feature can help you achieve that! You can easily link your Google account in just a few simple steps. We have several other Single Sign On options including Okta, OneLogin, and Saml 2.0 to ensure we cover all the needs of your business.